Come along and hitch a ride on Dahl Quarray’s flights of fancy and walks through the whimsical world where he lives. But be prepared to stop and ponder as often as you giggle and guffaw. His words make both sense and nonsense. His themes span bridges of understanding as well as inane paths to nowhere in particular, but always with a purpose: to entertain, to inspire, to pose ideas, to bring you somewhere you yourself hadn’t thought to go, but are happy you did. Dahl Quarray steers his literary vehicle with skill, sensitivity and a clear sense of direction, which can only be described as “east/west/north/south.” The horizons of his world are not boundaries; they are invitations to reach beyond the sky-and-water lines we see every day. 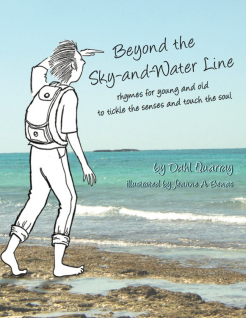 Aware that they beckon you, Dahl Quarray helps guide your journeys wherever they lead.